Jeannette Walls’ life story is almost too good to be true. The Glass Castle calls to mind a lot of literary forebears and flows together so seamlessly, it seems like a work of fiction. It’s a rarity for reality to be so purposefully messy. 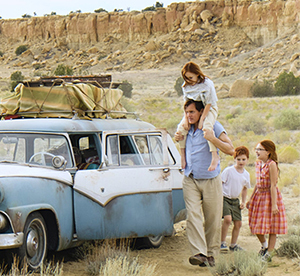 Nonetheless, The Glass Castle is based on Walls’ memoirs. Back in the 1980s, she was a New York City gossip columnist who kept her own past of abject poverty in the shadows after managing to break out of a life of perpetual misery and abuse while growing up under free-roaming, nomadic parents. Even having found considerable success — including writing for New York magazine — Jeannette’s quest wasn’t complete. She wanted to write something more meaningful than a high-society column. One of those literary progenitors is Ernest Hemingway’s A Farewell to Arms, wherein Hemingway observes, “The world breaks everyone and, afterward, some are strong at the broken places.” Another one is Paul Theroux’s The Mosquito Coast; Jeannette’s father, Rex, is reminiscent of Allie Fox, a know-it-all with a crazy vision to pull his family out of the material world while on a quest for something more primeval and self-reliant. Don’t cling to the side. You can do it if you want. You learn from living. Everything else is a damn lie. It’s the struggle that gives life its beauty. But The Glass Castle is not a sappy, woman-searching-for-herself love story; it rises above the bathetic and provides some healthy food for thought. Jeannette’s parents were many things. Free spirits. Squatters. Co-dependents. Dysfunctional. Dreamers. With the same propensity to milk the system as Christopher McCandless, another real-life high-minded soul-searching moocher documented in Jon Krakauer’s Into the Wild, Rex felt totally within his rights to rail against the system of financiers, developers and landlords. “Don’t live off a handout,” he advises. And yet Rex spent a good portion of his life doing just that, squatting on other people’s property, hotwiring electricity and pinching family funds in order to satiate his thirst for alcohol. He couldn’t hold a steady job, or perhaps it’s more likely he simply didn’t want to. He’s a hard man to like, but he’s also a hard man to flat-out hate. He was a drunken, abusive quack — but he was also a smart, boundary-pushing dreamer. The opening words are spoken by Rex, who criticizes the rich folks living in their city apartments, unable to see the stars at night because of all the air (and light) pollution. And that notion leads to the titular Glass Castle, a flight of fancy, an aspiration that was never really intended to come to fruition. It was supposed to be the Walls family dream house, including a glass spiral staircase and a glass roof, so the family can enjoy those stars from a prime hillside vantage point. Instead, camping out amongst the Joshua trees is par for the family course. As Rex tells Jeannette, “You were born to change the world, not just add to the noise.” That’s quite a statement, quite a grandiose ambition. A large swath of Rex’s approach to life can be considered a challenge to how “quality of life” is defined and who sets the definition. In the case of the Walls family, they’re setting a certain life standard with their children, but many people also face the same question at the other end of the spectrum while caring for the elderly. Sharing in Jeannette’s journey is quite a ride. Brie Larson (Room) portrays the grown-up, successful Jeannette as a reserved adult who’s put up barriers in regard to her family and her personal history. While accompanying her fiance on his client wining-and-dining engagements, she reminds him to allow her to do the lying about her background. After a while, though, Jeannette grows tired of the lies, resets her values and forges a new path for herself. While Larson’s Jeannette is reserved, the portrayals of the younger Jeannette are surprisingly nuanced. Chandler Head (The Boss) shines as the youngest Jeannette, but 12-year-old Ella Anderson (Mother’s Day) steals the show as Jeannette lovingly tackles her father’s drunkenness and takes a stand against this nuclear family’s toxic environment. As for Rex, Woody Harrelson (Lost in London) impresses once again, owning the role as he ages from adventurous young father to New York City vagrant. Naomi Watts (The Impossible) finds the balance in being unbalanced as Rex’s co-dependent wife, Rose Mary. She’s all-in on the life choices Rex makes, and she’s also self-absorbed with her own art to the point of being a hands-off mother.